Say the words “Test Data Management Strategy” anywhere in your office and you’ll probably be met with a collective sigh. This reaction could be motivated by the frustration of Testers who understand its critical importance to application success, but can’t secure the budget for it. Equally it could be a sigh of irritation from C-suite and budgetary decision-makers who believe TDM is time consuming and costly and lies only within the remit and interests of QA. Or it could be borne out of a paradoxical combination of fear and fatigue from anyone involved with getting your business GDPR compliant by 25th May this year! The business benefits of Test Data Management are in fact significant and far reaching. The key to overcoming the first hurdle, getting buy-in from budgetary decision-makers, is to paint the bigger picture outside of Test and QA and demonstrate the value of TDM to the whole business. It’s also key to point out the risks of using poor quality data and pre-empt the challenges that nay-sayers will come up with, while offering concrete solutions and strategies. There is ever-increasing pressure for software development to be faster, better quality and more cost-effective and, to achieve this, every true contender has turned to Agile development and testing in a DevOps culture. It’s therefore somewhat alarming that, responding to the 2017-18 World Quality Report survey, 99% of businesses said they’re facing serious challenges with testing in an Agile development environment. Interestingly, lack of good quality test data is the top challenge! Accurate, relevant, high quality data is essential to the cornerstones of Continuous Delivery - Test Coverage, Automation and Continuous Testing. With quality data, you can find defects earlier in the development lifecycle for a cheaper fix and less risk of bugs in production. If testing and QA fails due to poor data quality, your end-product fails too. The knock on effect is unhappy customers who complain to potentially millions of people on social media and switch their loyalty to another brand, taking friends, family and followers with them. Conversely great data hygiene, improved security and streamlined data management, result in an enhanced Customer Experience (CX), Digital Happiness, customer loyalty, better brand reputation and higher revenue. Another obvious standout benefit of getting to grips with your data, not just for test but enterprise-wide, is of course, complying with the impending GDPR. The benefits here are mitigating the risk of hefty fines; reducing the risk of security breaches; and improving revenue by leveraging quality data to drive effective decision-making and take advantage of opportunities for upselling and cross-selling. Furthermore, data discovery and management are the first steps to reaping the benefits of Sogeti’s new smarter approach to testing, Cognitive QA, which utilises quality data to enable Automation, AI, Robotic Process Automation and Smart QA Analytics. For testing this means you can automatically identify the most effective test set in your regression suite, automatically prioritise the right test cases for automation and automatically provision self-adaptive test environments. Relying on a foundation of good data, Cognitive QA aligns the test function to your desired business outcomes; minimising risk and delivering far higher quality software and products to market, more quickly, for less cost. The right Test Data Management strategy accelerates time to value for business-critical applications, builds relationships and efficiencies by enabling insights driven decision-making across your entire organisation. So now we’ve established the wider business case, let’s get an overview of the risks, challenges and how we can address them. SMACT, IoT, legacy and new databases and all the unstructured and structured data they yield, create a very complex data landscape with different types of data stored in multiple environments making it hard to access and increasing the potential for a data breach. Different types of data are required for the various types of testing, from Performance to User Acceptance testing, so you need to organise your data properly from the outset to keep within test time constraints and avoid spiralling costs. Data Security is paramount, so new security processes and a cultural shift are required to ensure that confidential data is not copied into emails and that live production data is not compromised by use in test environments. Last but not least is compliance with all the Data Privacy laws and Regulations including the new GDPR. Several technical challenges arise from having to balance the efficacy of the different ways you can sort and protect your data during testing, with the cost, time and risk associated with each one. These include the initial data discovery process, masking, encryption, sub-setting and cloning production databases; and generating synthetic test data. There are also challenges such as getting universal buy-in for your TDM strategy and assuaging common misconceptions such as the idea that synthetic data won’t look like proper live data – which it will, if done properly. For a deeper dive into the pros and cons of each, and how GDPR compliance will affect your choices, check out our blog “How to Create Your GDPR Compliant TDM Strategy”. Two of the other biggest issues are masking unstructured data and archiving data. The good news is that Sogeti has been working with some excellent data tooling partners and can now offer a leading edge automated solution for masking unstructured data. The next 2 blogs in this series will be looking at maximising the value of unstructured data and archiving, so watch this space. Sogeti’s Digital Data Services and our new Cognitive QA approach to testing address all the risks and challenges of TDM, providing you with a current state evaluation; a roadmap and strategy; data discovery and organisation; centralised and automated set up and sub-setting of test data; and all the different types of test data protection, to accelerate your test cycle while keeping costs down and security at an optimum. Our partnership with CA Technologies, brings best in class tooling and rapid test data provisioning to our solution. Combined with Sogeti’s expert consultancy and the proven strategic TDM approach of our test teams, CA’s “Test Data Manager” enables automated Test Data Discovery; eliminates manual data creation and Masking; provisions test databases in seconds and optimises data sharing so you can access high quality, relevant test data, on demand. Follow these links for more information and to discover the benefits of our TDM services, GDPR Services and Cognitive QA. (2/5/2018) The Myths and Legends of the GDPR - Film Quiz. 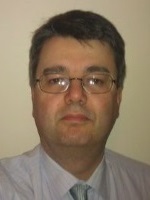 Andrew is currently a Managing Consultant for data projects at Sogeti UK. He has 20 years experience working in data management and information lifecycle management including contract delivery roles for IBM and as a delivery manager for Informatica.